First week back at school for my tot after the break. He seems to be adjusting pretty quickly. But Steve had a work trip for a few days right after staying home for a long time, I didn't find it easy. It was just a few days but I really missed him! During the holidays, our tot kept asking us to take him to a Korean restaurant and as Steve isn't a huge fan of Korean food, he told our tot that he can have Korean food as much as he want when daddy's away. So of course, while he was away, we ate plenty of Korean food. I couldn't believe my tot actually asked for Korean food so often like that. Anyway, the night Steve's coming home, tot ironically asked for one of Steve's favorite chicken dishes. It worked out for everyone. 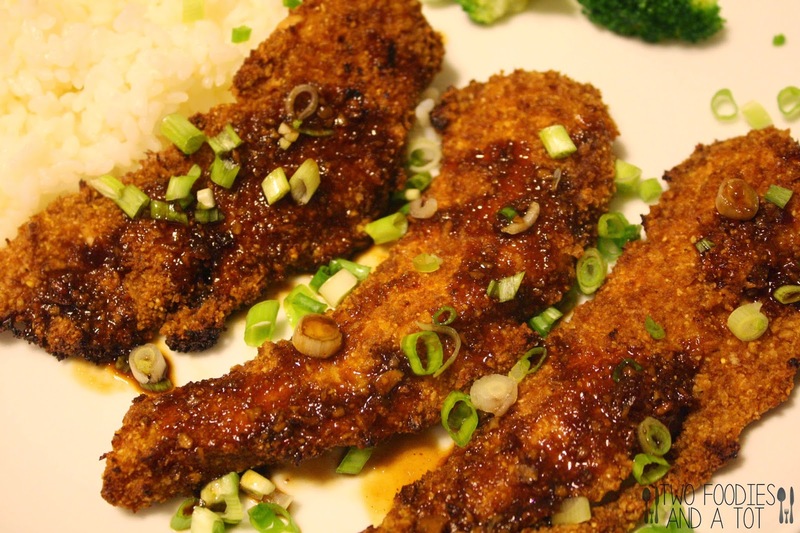 When you make the sauce, you should definitely use light soy sauce(low sodium soy sauce). Otherwise sauce will be way too salty. I usually like to eat plain steamed or blanched broccoli with saucy dishes. And that's how it was served as well. I changed the original recipe very slightly. I think balsamic vinegar adds extra sweetness to the dish and I love it. It might sound odd to use it in Asian inspired dish but it really goes nicely with Asian dishes. I sometimes use balsamic vinegar alone for dumplings instead of dumpling sauce. 1. Preheat the oven to 450F. Soak chicken in the buttermilk. Grease a foil lined baking sheet. 2. Mix panko, cornmeal, olive oil and salt and pepper. Remove chicken one at a time and coat with crumb mixture. Place them on prepared baking sheet and bake for 10 minutes, flip and bake another 10 minutes. 3. While Chicken's baking, mix all the sauce ingredients in a sauce pan. Heat it over medium low heat and simmer until slightly thicken. Dunk the chicken in the sauce one at a time and put them back on the baking sheet, bake another 5 minutes. 4. 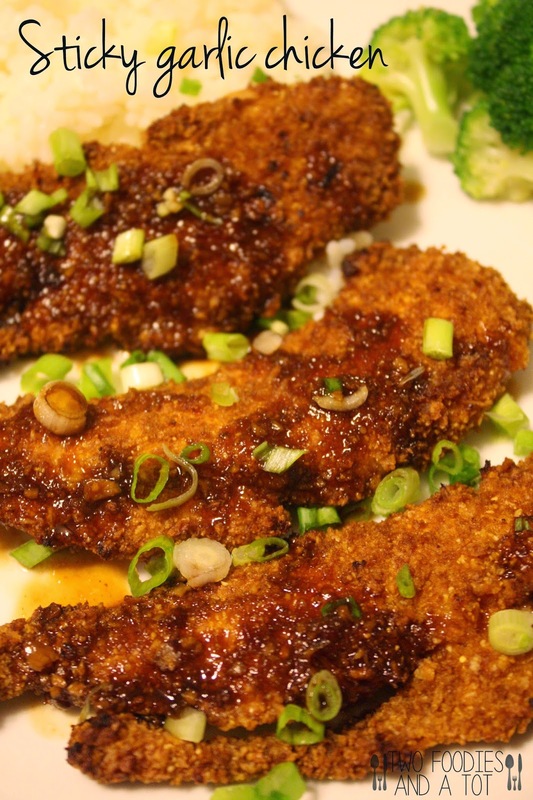 Either drizzle some sauce on top or dip the chicken in the sauce again and sprinkle scallions. Serve it over rice and steamed vegetable of your choice. *Recipe slightly changed from Pinch of yum.